The twice daily changes in water levels (usually just called the tides) are caused by the gravitational pull of the moon and sun. The changes in water levels in turn generate tidal currents in the Bay which change direction twice a day. These tidal currents form a complex network and can change speed and direction in less than a hundred feet. While most of the water in the Bay flows in from the Ocean as the tide rises and out to the Ocean as it falls, many small currents or eddies flow in the opposite direction. In contrast, currents in the open ocean are generated by the temperature difference between the equator and poles (in conjunction with winds), and by the rotation of the earth. They are hundreds of miles across and extend for thousands of miles, forming giant loops that carry much of the heat from the equatorial belt to the colder regions of the earth. These currents take years, sometimes thousands of years, to change significantly. Rowers are interested in water turbulence as well as the velocity of a current. However, both turbulence and local velocity depend on the detailed geometry of the shoreline and the bottom of the Bay, as well as the average velocity of the current. While the current charts prepared by NOAA provide an essential framework, they do not contain all the detail a rower would like. Thus, much of the knowledge desired must be gained by experience. Sharing experiences between rowers can be very useful, since a complete understanding of the effects of currents along a route requires rowing that route during many different conditions. However, for rowing experiences to form a useful pattern, they must be correlated with the times and magnitudes of the currents. The moon is much less massive than the sun but it is much closer to the earth. In this case distance trumps mass and the effect of the moon on tides is about 2.5 times as great as that of the sun. Directly under the moon the ocean bulges upward, and less intuitively, there is also a bulge on the opposite side of the earth [explanation]. As the earth rotates around its axis each day, the two bulges of water move around the earth causing the tides. There are typically two high and two low tides per day. However, the moon orbits the earth about once every 29 days in the same direction the earth rotates about its axis. Thus, each day the moon is at the same angle above the horizon a little later. The time for the moon to appear to return to the same relative position in the sky is called a lunar day, which has an average value of 24 hours and 50 minutes. Thus, corresponding high and low tides also come about one hour later each day, and some days there are only three high and low tides. The axis of the earths daily rotation is inclined about 23 degrees to the plane of its annual rotation around the sun. At the latitude of San Francisco (38 degrees North), the tilt of the earths axis causes the sun to appear high in the sky at noon during summer and low at noon in winter, generating the (solar) seasons. The moon rotates around the earth in approximately the same plane that the earth orbits the sun, thus there are also lunar seasons seen as changes in elevation of the moon above the horizon at noon of each lunar day. However, the four lunar seasons occur during a 29 as compared to a 365-day period for the solar seasons. The figure on the left shows the position of the moon during a lunar winter for San Francisco, which I used illustrators license to indicate as a green island on the blue ocean. The circular dashed line indicates sea level if there was no moon, the horizontal dark blue bulges indicate high tides, and the vertical lighter zone around the middle of the earth marks the low tide. The pull of the moon has distorted the surface of the water to form a blunt football, an ellipsoid. In San Francisco, we would experience a modest high tide, a low tide, a large high tide, and a second low tide equal to the first one. A daily tidal pattern with unequal highs or lows is called mixed. About seven days later the moon has moved a quarter of the way around the earth to create a lunar fall, as illustrated in the figure on the right. Now there are two equal high and two equal low tides at San Francisco. This tidal pattern is called semi-diurnal. While the moon exerts the greater tidal force, the sun still has a significant effect. When moon and sun are pulling either in the same direction (new moon), or opposite directions (full moon), the gravitational forces are simply additive. However, when the moon and sun are at right angles to the earth (quarter phases of the moon), the situation is more complicated. The smaller tidal bulges from the sun partially cancel the bulges from the moon, and the lows from the sun subtract from the highs from the moon. Thus, both low and high tides can be unequal. In extreme situations only one high and one low tide each day may be apparent, a diurnal tidal pattern. To complicate matters, the orbit of the earth around the sun is not actually a circle, but rather an elipse: in the winter the sun is closer to the earth than in summer, and the tides are thus more extreme. The orbits of the moon and sun are not exactly in the same plane, so variation in the angle between the two causes some variation in the direction and magnitude of the sum of the pulls of the two. While I hope the two diagrams and this discussion explain the general pattern of tides, I may have also convinced you that accurate prediction of the sum of the pulls of moon and sun on the earth is not for the faint of heart. If the earth was entirely covered by a deep ocean, the response to tidal force would be two tidal waves a few inches high that swept around the globe once each 25 hours. On the real earth these tidal waves sweep up against and away from the shorelines. The actual daily changes in sea level at shores around the world range from one to fifty feet, depending on the shape of shoreline and ocean bottom in the vicinity of that location. Large tidal ranges are seen in areas where the ocean is confined, e.g. bays and the mouths of rivers. If the natural frequency at which water oscillates in the confined space is close to the tidal frequency (one cycle in 12.4 hours), or to a multiple of that frequency (two or more complete cycles in 12.4 hours), the water in the space will resonate with the tidal force and create large tides. The resonance of a system with a periodic force is illustrated by pushing a person in a swing. The best timing is to push at the same frequency as the swing moves when it is not pushed: its natural or resonate frequency. However, if you push at every second, or third, or forth swing, energy still builds up and the swing goes higher. If you push every 1.5 times the natural frequency, the swing will just jerk back and forth. The shape of the bottom and shoreline not only influences the tidal range, it also can have a significant effect on the time of high and low tide. This is particularly true if the water mass shares a resonance with the tidal force or the water is shallow. Thus the times of high and low tides can differ by hours at locations that are only a hundred, or even a few tens of miles apart. The difference in time of high and low tides is called the phase of the tide. The surface of the ocean also responds to changes in atmospheric pressure and winds. When a storm moves into a costal location the air pressure is usually low, which causes the water level to rise. If the wind is also blowing across the ocean toward land, water is pushed in that direction. This combination can cause the water level to rise several feet causing as much damage as the other effects of the storm. The storm tides are of course not regular and periodic, as are the gravitation tides. In summary, while tidal forces can be accurately calculated and predicted from astronomical observation, the response of the ocean to those forces depends on the shape of the shore line and the topography of the ocean bottom. These factors are so complex that tides are predicted by making observations at a specific location over a period of many years and then correlating the levels with the known astronomical data. You can purchase clocks, particularly in marine equipment stores, that have a tide dial (like the one on the right). These purport to show the times of high and low tides (but not the levels). The principal is that the tide hand is geared differently than the hour hand, rotating it twice around the dial every lunar day, thus in synchrony with the tidal period. The tide hand has to be set, independent from the time setting, because of course the tides at various locations occur at different times. The intuitive way to do this is to find the local tide times in a newspaper, tide book, or on the Internet, and set the clock. However, from the previous sections of this essay it is clear that the tides are not simply periodic, the low and high tide times and levels follow a more complex pattern. This creates two related questions. 1. Since the tide times are not simply periodic, it would be best to set the clock to a periodic "average tide" for the area. The times for the real tides would then be sometimes earlier and sometimes later than this "average tide" shown on the clock, but the error would be minimized. How does one find the times for this "average tide"? 2. When the clock is set to the "average tide", what are the sizes of the differences from the real tides? The predicted tides at Sausalito for the year 2005 were obtained from NOAA and a linear (straight line) best fit to the data was obtained. The equation for this line were used to calculate "average" times for the tides (the actual times of the average tides are here, but best read on before taking the trouble to get them; they were calculated using a Perl program). As you see below it's not a pretty picture. The vertical axis on this graph is the difference between times of the real and average high and low tides. This is a messy graph because there are so many points (about 4 per day, almost 1500 total). The important conclusion is that many differences (more than 10 percent) are greater than 60 min, and a few are 120 min or greater. Note that this is the graph for one location. In other locations the tide times will be more or less regular and thus a simple tide clock more or less accurate. Now we know that tide clocks may only give an approximate time for high or low tides. However, let's soldier on and try to see if our knowledge of the origin of tides can avoid the work of calculating an average tide to set our clock by. The tide times should be the most simple when the moon and sun are pulling in the same direction, i.e. the full and new moons. Lets look at the first three months of the Sausalito tides to see more detail and also test this strategy. Here I have shown the LOW tides as s red line, while the HIGH tides remain blue dots. The double lined arrows (at 10, 39, etc. days) indicate the times of the new moon, and the solid arrows (at 25, 54, etc. days) indicate the time of the full moon. Unfortunately, these times are not the times at which the real tides coincide with the "average" tide. Tides are usually defined as changes in water level. However, the same force that cause the water level to go up and down also produces currents. It is not very useful to say that changes in water level cause currents or that currents cause changes in water level. Both are caused by the tidal force, and are thus related to each other, but in a complex way that is very dependent on the topology of the shore and ocean bottom. Tidal currents are even more dependent on the shape of the body of water than water levels are. In addition, currents, by their basic nature, are more complex than levels. In open, deep ocean only a slight movement of water is associated with passage of the tidal bulges, and it would not be large enough to be called a current. On the other hand, currents in a constricted body of water, like a bay or a passage between islands and the mainland, often have velocities of many knots. Since currents depend so much of the shape of the shore and bottom, it is not very interesting or useful to discuss currents in a general and vague context. Instead, it is preferable to pick a specific location and describe the currents there as an example. San Francisco Bay is a beautiful body of water, with many significant tidal currents. The Bay has a healthy maritime business and thus the tides and currents have been, and continue to be carefully studied. Many people visit San Francisco on business or pleasure and thus have a chance to see the bay themselves. Finally, I live on the Bay and row on its surface (mostly) several times a week. I am thus taking advice often given to authors, "write about something you know about" by picking San Francisco Bay as the example for a description of tidal currents. The Bay (122 W, 38 N), is on the West coast of the United States, in the State of California. It is the mouth of the Sacramento River and tributaries, which carry about half of the rain runoff from California into the Pacific Ocean. Until about 10,000 years ago the river flowed through a gently sloping valley and out into the Pacific Ocean through a narrow gorge, gradually cut through the costal range of hills as they were pushed up by tectonic forces. As seen in the map to the right, there was essentially no bay at this time. As the last glaciers melted, the valley floor sunk and the ocean filled it to create the present Bay, 50 miles long and 1 to 12 miles in width (with an area of 400 square miles). As would be expected from its origin, much of the Bay is shallow, especially at the Southern and Northern ends, and along the Eastern side. In addition, the Northern end of the Bay has been silted by huge amounts of silt and rocks washed down the Sacramento River during the gold mining days of the 19th century, when giant water jets were used in the foot hills of the Sierras to wash away top soil and expose gold deposits. The average depth of the Bay, excluding mud flats, is 20 feet. However, the exit to the Ocean, the Golden Gate, is quite deep, 300 feet at the middle. The exit channel is kept clean by the scouring action of tidal currents that often exceed 5 knots. Approximately 30 percent of the total water in the bay flows in and out of the Golden Gate twice a day. The amount of fresh water flowing down the Sacramento River varies from about 300,000 cubic feet/sec during the spring to 3,000 cubic feet/sec during the fall. However, even during the spring the river flow is small compared to the flow due to tidal exchange. Rivers create a bar as they flow into the ocean and deposit silt picked up from the upstream river bed. The bar of the Sacramento River starts a few miles outside the Golden Gate and extends over a crescent with a radius of about 30 miles. The water over the bar is quite shallow, for example 20 to 30 feet in the Northern sector, which is named Four Fathom Shoal (a fathom is 6 feet). A local name for this shoal is "The Potato Patch". During the second half of the 19th century small boats carried farm produce down the coast to the growing town of San Francisco. Potatoes were transported in bags on the exposed decks of these boats, and the rough water often dumped the potatoes overboard. The small, rocky Farallon Islands, 30 miles West of the Golden Gate, mark the edge of the bar, for the ocean bottom drops to depths of many thousands of feet beyond this point. The water over the bar is called the Gulf of the Farallons. Some of the most interesting tidal currents occur in the central part of the Bay, indicated by the small square in the map. Angel Island, a State Park, is in the upper right corner of this square. ...you see hills, green trees, shrubs and grass. On the water surface there are buoys that guide ship travel. They are usually red or green, and labeled by a number or sometimes one or two letters (red 2, at the entrance to Richardson Bay is actually a sign on a telephone pole). Over a days time you will see several ships leave the Bay and pass under the Golden Gate Bridge, bound for sea, following the dashed line on the chart. You should also see several ships come into the Bay, but they follow a southern path (not shown on this chart), to the South of Alcatraz Island. ...land topology is as complex and interesting as above. Now we see that all of Richardson Bay is very shallow. There is a narrow channel which has been dredged up the bay along Sausalito to provide access for ships that draw less than 20 feet. The "Red 2" telephone pole that seemed to be placed arbitrarily in the middle of the water is now seen to be at the entrance to this channel, and on the edge of the deep trough that extends up from the Golden Gate through Raccoon Strait. A large fraction of the water that ebbs and floods up the Sacramento River passes through this underwater valley. Now it is clear why ships leaving the bay pass between "green 1" and "HR" buoys: they don't want to hit the rocks! The incoming ships use a Southern lane that passes below Alcatraz Island. The black, red, and white lines are profiles along the corresponding dashed lines across Raccoon Strait. The following graph shows the water level and current velocity a mile West of the Golden Gate Bridge. If all the water in the bay were in dynamic equilibrium with the ocean, the current would be zero when the direction of the tide level reversed, i.e. at low and high tides. Instead, there is about a 1.6 hour lag between the time of zero tidal current (slack tide) and the low or high tide levels. To a first approximation the current is a response to the change in water level. The important word here is change. If the level were always high or low there would be no current. The rate of change of water level is the slope of the black line. The rate is maximum half way between low and high (or high and low) tide when the slope of the black line is the steepest up or down. Conversely, the rate of change of water level is zero at high or low water when the black line is horizontal. As seen in the above graph, zero current (slack tide) occurs 1.6 hours after the time of zero change in tide level (in this example the high water level). This time lag depends on location, and also changes from tide cycle to tide cycle throughout the year. In order to accurately predict the tidal levels or currents at a location it is necessary to observe water levels or currents for at least many months, ideally for 18 years. These observations are then used to determined dozens of harmonic coefficients which in then enable predictions of levels and currents into the future. However, there are many more locations for which predictions are needed than there is money to make measurements. The solution is to create a few reference stations where complete measurements are made, and a cluster of subordinate stations in the neighborhood of each reference station. Only a few measurements are made at each subordinate station, and the levels or currents are related to the reference station by constant time lags and speed factors. This strategy is quite effective for tide levels, but sometimes less so for tidal currents because they can change so drastically with location. Prior to the year 2001 there was one reference station for SF Bay "San Francisco (Golden Gate)". This station was actually about a mile outside (South and West) of the Golden Gate. In 2001 four more reference stations were added. The new station for the central part of the bay is "Golden Gate Bridge", about 0.7 miles to the East (inside) of the bridge. The original station was renamed "San Francisco Bay Entrance (Outside)", and is still the reference for tides and currents outside the bay. The panels on the left and right are excerpted from "TIDAL CURRENT CHARTS, SAN FRANCISCO BAY, sixth Edition, Reprint of July 1973", by US Dept of Commerce, National Oceanic and Atmospheric Administration, National Ocean Survey. They show the average observed currents at the time of maximum flood and ebb at the Golden Gate. Corresponding charts for each of the 12 hours of a tidal cycle can be seen in the appendex. Currents tend to be large in the deep passages connection the Golden Gate to large areas in the bay. However, the pattern of currents is complex and can't be predicted just by intuition or inspection. The current at any of the locations marked by velocity arrows on the current charts can be characterized by plotting the velocity versus time and fitting a smooth wave like curve to the data . Using this fitted curve you can find the maximum flood and ebb velocity and the time lag from a reference current, e.g. at Golden Gate. The table below gives these parameters for the current at the Golden Gate and currents at five locations near Angel Island. 1. Current velocities and phases (time lags) can be quite different even at nearby locations. Pushing: water that moves pushes the water ahead of it. Pulling: water that moves pulls the water behind it. Dragging: water that moves drags along nearby water and the shore and bottom exert a retarding drag. Inertia: it takes force and time to change the velocity of water. Conservation: as water moves it is neither created or destroyed. The following current map at maximum flood tide, was calculated by the US Geological Survey (http://sfports.wr.usgs.gov/SFPORTS). Since the current arrows are now evenly spaced on a close grid, you get a better picture of the overall pattern of currents compared to the NOAA current charts based a smaller number of actual current measurements, (speciallized radar can also measure currents on the water surface, see http://sfports.wr.usgs.gov/rtcheng). 1. Currents are large through the Golden Gate: all the water that floods the Bay has to pass through here. 2. 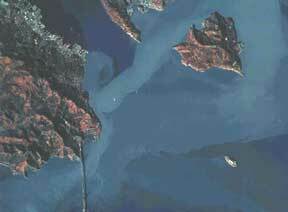 Currents are small throughout Richardson Bay: the bay is small, it only takes small currents to fill it. 3. Currents are large through Raccoon S: this is a main passage for water flooding the Northern part of the Bay and the huge Sacramento River system. Current velocity increases over Raccoon Shoal: water is constrained to a small cross sectional area as it passes over the shoal, thus the velocity must increase. Conversely, the current is low just off Belvedere Point, where the water is deep and the cross section is large. 4. The flood current splits around Angel I, and are small in its "shadow". Two hours later the current along the East side of the island will increase and become part of the flow of water flow toward the North part of the bay and the Sacramento River. The fact that the current along the East side of Angel I lags the other currents was seen in the previous table of current time lags. The current arrows in the simulation appear to be a good approximation of the actual of water velocity below the surface, as they agree with measured values at selected locations in the bay. However, as is shown below, currents at the surface often have a more complicated pattern, particularly on a small scale. Up to now we have implicitly assumed all the water in the bay was the same type of water. However, San Francisco Bay is the mouth of the Sacramento River, and in late winter and spring a large amount of relatively warm, fresh rain water flows down the river into the bay (San Francisco has a Mediteranian climate with all the rain falling in the winter). Both salt and colder temperature make ocean water more dense than river water and thus the river water tends to float on top of the ocean water. When the tide floods, the ocean water flows through the Golden Gate and pushes the river water back to the North part of the bay, while when the tide ebbs both river and bay water flows into the ocean. The river flow is always smaller than the total water that flows in and out through the Golden Gate each tide cycle. However, even if the river flow is low the water flowing into the Bay warms compared to the ocean and thus on the ebb relatively warm water flows back into the ocean. Infrared cameras show this warm ebb water as it flows back into the ocean. The aerial photograph on the right covers almost the same area as the previous charts. Angel Island is toward the upper right, and the Golden Gate Bridge is in the lower left section. This photograph was taken when the tide was ebbing, after rains had generated heavy water flow down the river into the bay. The rains had also increased the amount of silt in the river water, causing it to appear a light shade of blue against the darker ocean water. The river water flowing through Raccoon Strait toward the Golden Gate forms a lighter colored plume directed at the shore just above the Golden Gate Bridge. It collides with the shore, and a portion is pushed North to form a vortex, while the rest flows South along the shore and then passes under the bridge. Some of the river water flows along the East side of Angel Island, and then turns to flow out toward the Golden Gate. Thus river water does not immediately mix with the ocean water it is flowing through. Instead, there can be a distinct boundary between the plume of river water and the ocean water. For about an hour after the average tidal current has changed direction, the current velocity changes abruptly as you cross the ocean-river water boundary (more on the plume). The paths of currents are not simply a giant fan radiating out from and into the Golden Gate. In many locations a vortex, or circular current, forms. The vortex may be only a few feet or a half a mile across, and rotation during ebb and flow currents need not be exactly reversed. The vortex usually gradually merges with other, linear, currents, and thus the current patterns in the bay can be very complex. As one example, the average current in one location does not have to be zero (even when the flow from the Sacramento River is discounted). If you were rowing in a race, you would rather row with the tidal current, not against it. However, since the time and location of the start and the location of the end is specified, the only choice is your route. As we noted previously, sometimes you can change your route slightly so you row through currents that are more to your advantage. If you are not in a race, the importance of currents is usually not the velocity per se, but rather the water turbulence generated by movement of the water, e.g. rip tides, eddies, and tide induced waves. This is not to say that turbulence is not important in a race. Even an experienced rower will be slowed by bad turbulence, and a beginner may be forced to drop out. • the current bends around a point or runs over a shoal region. • two currents moving in different directions merge, i.e. they collide. • a current flows in the opposite direction waves are moving, e.g. the ebb current flowing West through the Golden Gate meets wind waves and ocean swell moving to the East. • If there are segments of your row where significant tidal currents can occur, make note of the direction and magnitude before you start. • If the currents are expected to be very strong, you may want to pick an alternate trip. • If you have an option of direction, e.g. going around Angel Island clockwise or counter clockwise, the current might influence your decision. • If the currents are strong, you may want to avoid specific areas you know from past experience to be rough. • After the row, make a mental or written note of the conditions you encountered along the route and note the relation to the tide. We all know that the shortest distance between two points is along a straight path. However, if that path goes through a region of water turbulence or adverse currents the important parameter becomes the penalty in increased distance if we avoid these regions. The penalty depends on the geometry of the situation, including the route we take to avoid the trouble. It is probably intuitive that the route of avoidance should be as close as possible to the direct path. However, neither the best path, nor the magnitude of the distance penalty may always be obvious. Suppose we are rowing along a coast and see white water ahead, turbulence caused by a current passing over a shoal. How much further will we need to row if we go around it? The Figure below illustrates the problem. We are at A and see the shoal. The original plan was to row along the thick line directly to B, a distance of 200 yards. One way to avoid the white water is to row along the direct path to the base of the shoal, turn and go out a distance x, then return to the original direct path and continue on to B. If x is 10 yards, this will result in a total distance rowed of 220 yards. A shorter route is to follow the thin line: row directly to the tip end of the shoal and then row directly to B. While it may be obvious that this is the shorter route, it may not be obvious how much better it is, and how close it is to the direct A to B route: the total distance is only 201 yards. Even if we have to go out from the shore a little more, the penalty is not great, as seen in the following table. "Tidal Current Charts - San Francisco Bay" 6th edition, reprint of July 1973. As mentioned previously, this is out of print. "Tidlines": this yearly tide calendar is the best for currents (it is the only calendar I have seen that gives information on currents). It is on the desk at the Open Water Rowing Center. The "Tidal Current Charts - San Francisco Bay" are reproduced (in reduced scale) at the end of the calendar. See http://www.tidelines.com for information on the calendar and computer programs sold by the company. One program displays an animation of the currents in the San Francisco bay (I haven't seen it, and thus can't comment on its quality). The Internet contains an incredible amount of information. However, the contents are constantly changing; sometimes for the better, sometimes not. Using any search engine you can find many more sites than listed below: they are just to give you a start. The Department of Biological Sciences at the University of South Carolina gives you a calculator that produces a table or chart of water levels or currents at many locations. You first select a site, then select the time period (in the past, present, or future) and format for the data. The confusing feature of this page is that each selection should be called a data set, instead of a site. Selections that only list a location, give water levels, but a location followed by the word "current" give currents. 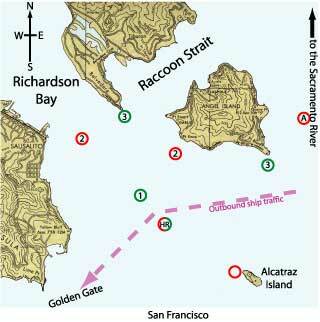 The two sites closest to Angel Island with current values are the Golden Gate and Alcatraz. San Francisco Physical Oceanographic Real-Time Systems: here you can get three day currents for several locations in the Bay Area. When the equipment is working, you get a graph of the actual values of water level and currents as well as the predicted values (they should agree very well, except during bad storms, in which case you shouldn't be rowing anyway, as Paul constantly tells me). The SFPORTS site maintained by the U. S. Geological Survey. Here you can get wind patterns over the entire SF Bay (simulated, they are based on a few key locations). You can also get current predictions and simulations. Don't be fooled into thinking that the simulations are actual measurements, they are the result of computer modeling (don't get me wrong, I love modeling, but you have to distinguish it from observation). The booklet, "TIDAL CURRENT CHARTS, SAN FRANCISCO BAY, sixth Edition, Reprint of July 1973", by US Dept of Commerce, National Oceanic and Atmospheric Administration, National Ocean Survey, represent the most recent general observations of the area. They are unfortunately not officially in print, although copies are widely distributed in various forms. This is thus one more distribution, in which only the central part of the Bay is represented. There are 12 charts, approximately one for each hour of an average semi-diurnal tidal cycle (the two high tide levels are equal and the two low tide levels are equal). Each chart is indexed to either the time of maximum flood, or maximum ebb tide. If you are interested in a day in which the tides are not semi-diurnal (a mixed tidal pattern) or the values of the high and low levels are atypical, the charts need to be interpreted in a modified way to be accurate. As seen below, the 12 charts are presented in 3 groups, 4 charts per page. Each page should take about 30 seconds to download using a standard 28 kb modem. I have attempted to format these pages so they can be printed on one sheet of paper.